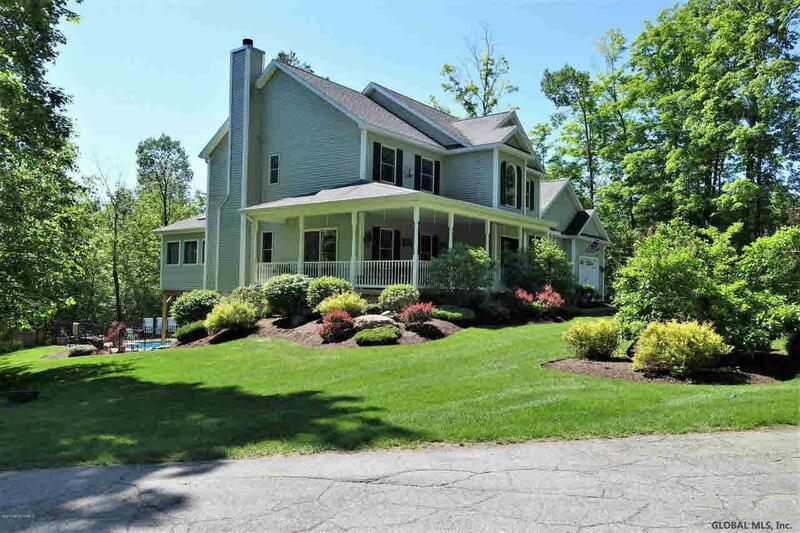 Everything you need is in this immaculately crafted Colonial loaded w/ amenities & close to the shores of Lake George. Plenty of room for all w/ 3 stories of living space including a fully finished walk-out basement that leads to the in-ground swimming pool. This glamorous house features a custom kit, liv & din area w/ Vermont Castings wood-burning fireplace, formal dining room, & a sitting room just off the cathedral foyer. There is a yr-round heated ADK style enclosed porch that leads to the deck, both overlooking the pool & beautifully landscaped yard. The Master Suite features a gas fireplace & spacious custom bath. 4 more bedrooms, 2 1/2 more bathrooms, a lg carpeted bonus room, & a family room w/ pellet stove complete this grand home. The 2-bay garage is extra deep to fit your toys.